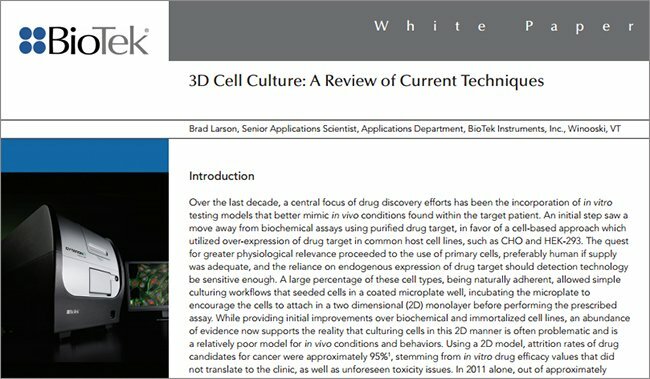 Accurate and sensitive tools that enhance the drug discovery process are an indispensible part of developing efficacious and safe small-molecule therapies. 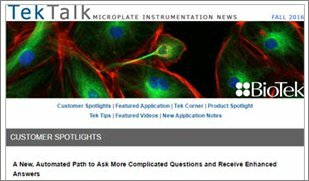 Building assays to assess these small molecules involves labeling technologies that require a number of different detection methods depending on the molecule of interest. 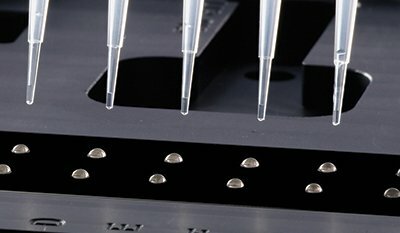 For high sensitivity and precise assays that minimize expensive reagent consumption, dedicated optical channels for fluorescence, fluorescence polarization (FP), fluorescence resonance energy transfer (FRET), and time-resolved fluorescence resonance energy transfer (TR-FRET) are required. 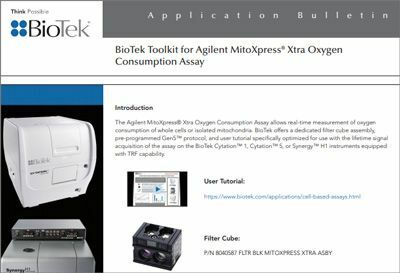 Using a portfolio of drug discovery assays from Life Technologies, the high performance capabilities of a new multi-mode microplate detection technology were demonstrated. 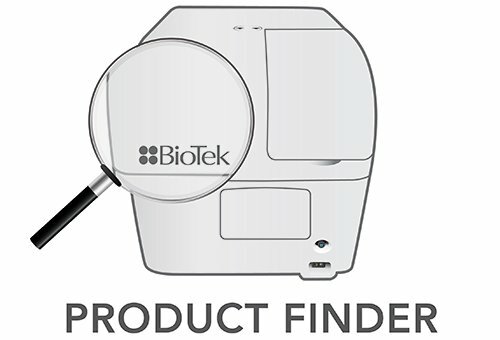 Among other applications, the BioTek Synergy™ NEO is designed to increase detection flexibility, speed and performance amenable to various elements of preclinical drug discovery, including target identification and validation, primary and secondary screening, selectivity profiling, and lead optimization. 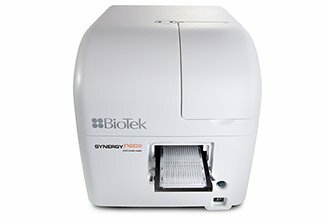 Synergy™ NEO’s patented Hybrid Technology™ combines filter- and monochromator-based systems in one compact unit. 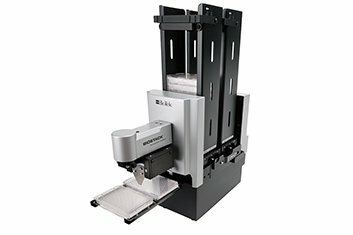 An optional integrated plate stacker with a 6-second plate exchange time increases efficiency and walk-away automation. 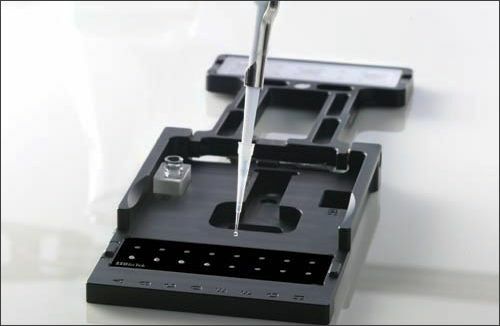 In addition to the precision, sensitivity, and read speed of the NEO detection options, ease of setup and use are a hallmark of this microplate reader. 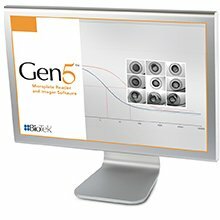 GeneBLAzer® Beta-lactamase Reporter Technology provides a highly accurate, sensitive, and easyto- use method of monitoring cellular response to drug candidates or other stimuli. The core of the GeneBLAzer® Technology is a Fluorescence Resonance Energy Transfer (FRET) substrate that generates a ratiometric reporter response with minimal experimental noise. 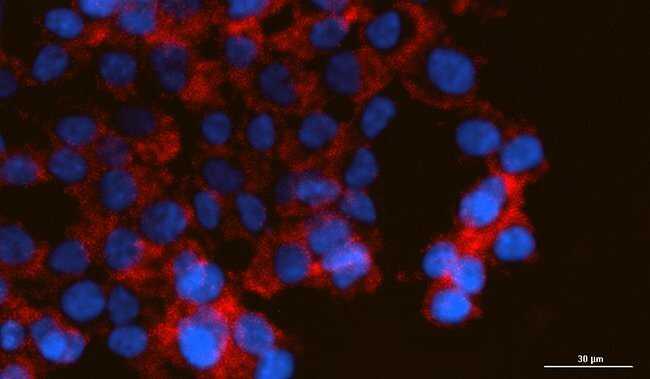 In addition to the dual-color (blue/ green) readout of stimulated and unstimulated cells, this ratiometric method reduces the absolute and relative errors that can mask the underlying biological response of interest. 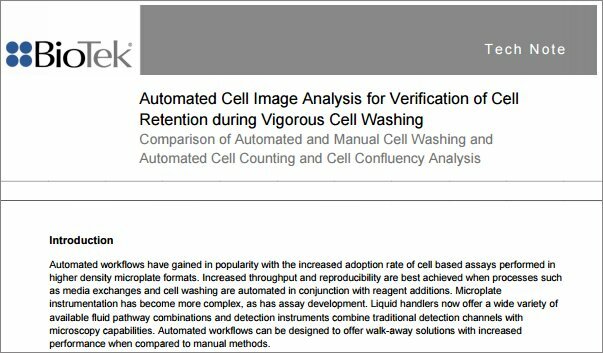 Such errors include variations in cell number, transfection efficiency, substrate concentration, excitation path length, fluorescence detectors, and volume changes. 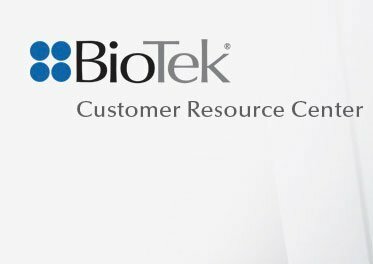 The GeneBLAzer® Beta-lactamase Reporter Technology has been proven in high-throughput screening (HTS) campaigns for a range of target classes, including G-protein coupled receptors (GPCRs), nuclear receptors, and kinase signaling pathways. 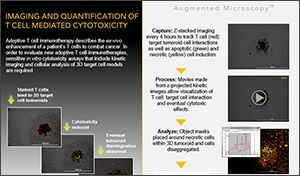 GeneBLAzer® assay protocols for Estrogen Receptor (ER) alpha and beta were followed using Division Arrested (DA) cells in agonist mode. 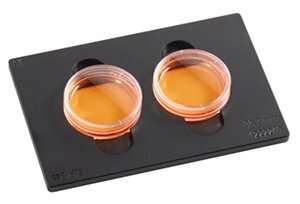 Briefly, dose response of ER alpha and ER beta DA cells plated at 2x104 cells/well in black clear-bottom 384-well standard volume (100 μL) microplates (Corning P/N 3712) were determined over 2 runs for two different stocks of 17ß-estradiol agonist run as 16-point 3-fold serial dilutions in replicates of 8 starting at 1 μM (ER- α) and 10 nM (ER-ß) agonist. 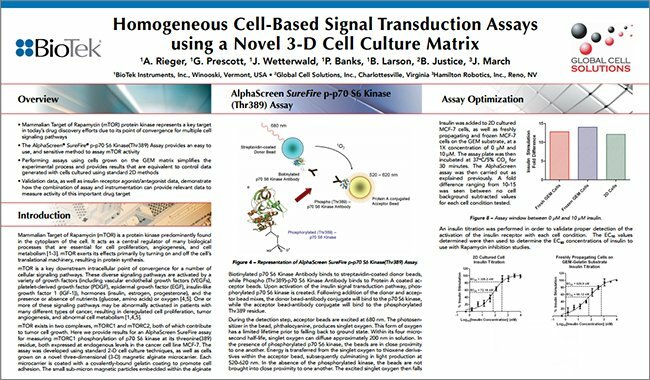 Each plate included 16 replicates of cell free controls (CFC) for blank correction, and 32 replicates of non-stimulated (8 μL Assay Medium w/0.5% DMSO) and stimulated (5x17ß-estradiol) controls for Z’ and response ratio validation. NEO was controlled by Gen5™ v 2.01.14 software as shown preceding. Plates were read after 2 and 4 hour incubation times. Time Resolved-Fluorescence Resonance Energy Transfer (TR-FRET) assays are less susceptible to compound interference than other assay formats and may be applied to multiple target classes, making them a preferred fluorescent assay format in drug discovery laboratories. The LanthaScreen® Assay platform offers two sets of FRET donor/acceptor pairs: Terbium/Fluorescein and Europium/AlexaFluor® 647. When donor and acceptor labeled molecules are brought into proximity, energy transfer takes place causing an increase in acceptor fluorescence and a decrease in donor fluorescence. The donor species used in a TR-FRET assay has a fluorescent lifetime that is many orders of magnitude longer than background fluorescence or scattered light, thus energy transfer can be measured after the interfering signal has completely decayed (time resolved). 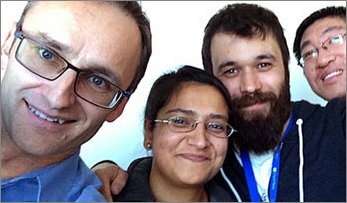 This characteristic decreases assay interference and so increases data quality. The TR-FRET value is determined from the ratio of the FRET-specific acceptor signal to that of the donor signal. Optimized read parameter settings were determined using the kinase binding assay format by running five dilutions of either Tb or Eu acceptor (Fl-poly-GT or Kinase Tracer 236 respectively) in replicates of 10 against 2 nM Tb-anti-GST or Eu-anti-GST donor dispensed to black and white 384-well low volume microplates (e.g. 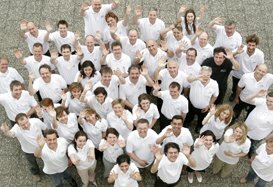 Corning # 3673, #3676). Two measurement/well options (10 and 100) at several gain configurations were analyzed to find reader settings congruent to the best assay performance results as calculated for Response Ratio (RR, normalized TR-FRET assay window), Z’, and CV%. 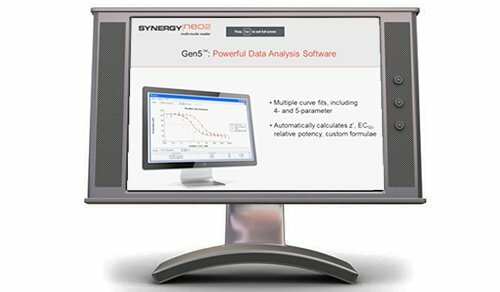 Optimal detection settings and data reduction parameters for Gen5™ v 2.01.14 software are shown preceding. 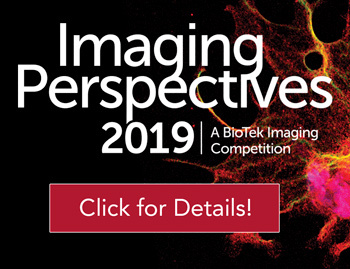 The ability to determine kinase activity and the effects of compounds that modulate this activity is essential for the development and screening of potential drugs against these enzymes. 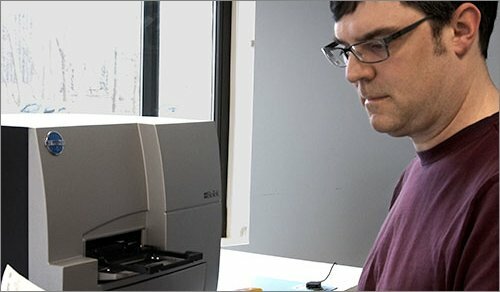 Omnia® Kinase Assays use the chelationenhanced fluorophore (CHEF) called Sox, an unnatural amino acid, which is incorporated into a kinase-specific peptide substrate. Upon phosphorylation of the peptide by the kinase of interest, Mg2+ is chelated to form a bridge between the Sox moiety and the phosphate group that is added by the kinase to the specific tyrosine, serine or threonine residue on the peptide. The fluorescence intensity is directly proportional to the amount of peptide phosphorylation. Demonstration of kinase inhibition was accomplished using active Tyr JAK2 kinases JH1/JH2 and JH1/JH2 V617F run at two concentrations (50 ng/well and 12.5 ng/well) with and without 1 μM staurosporine, a potent kinase-specific inhibitor, in replicates of three following the kit insert instructions. 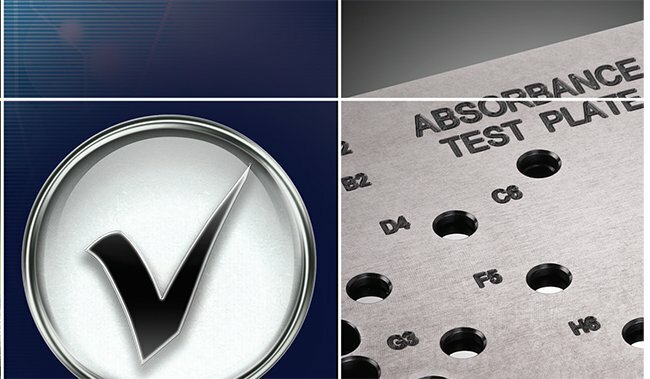 The assay was run in 384-well Corning white microplates (#3574) at a volume of 20 μL/well. Kinetic data was collected at the fastest interval (30 seconds) for the plate map over a one hour period. The Predictor™ hERG Fluorescence Polarization Assay Kit provides a set of validated components to perform hERG channel biochemical binding studies in the absence of radioligands. The assay was designed to identify potential hERG channel blockers by producing data that accurately correlates with patch-clamp electrophysiology studies. 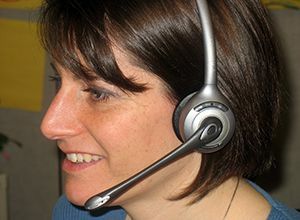 The assay is based on the principle of fluorescence polarization, where a red-shifted fluorescent tracer displays a high polarization when bound to the hERG channel and a low polarization when displaced by compounds that bind to the channel. Following the kit insert, two plates of data were run with 2 sets of compounds on each plate. Compounds were titrated as 16-point 3-fold serial dilutions in replicates of four with a starting concentration of 1x104 nM. Bound (NC) and displaced (PC) controls were run in replicates of 16 on both plates. Blank wells were assayed for optional data correction, but were not used in the final results analysis. Each plate was read every hour starting at 2 hours of incubation up to 5 hours of incubation. Data was generated for 6 individual measurement/well settings (10, 25, 50, 100, 150, and 200) to correlate detection sensitivity to read speed. 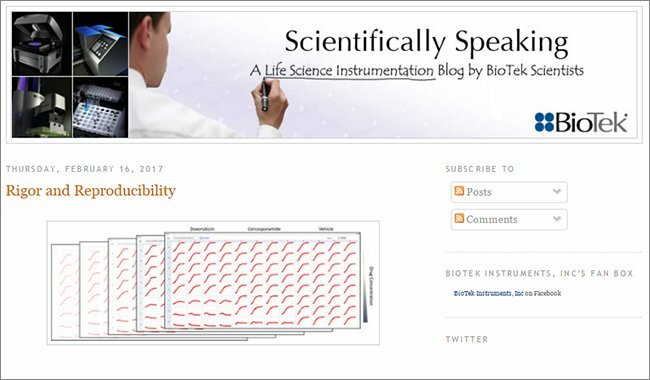 Pharmacology endpoints for instrument validation include Z’, assay window, precision, and IC50 data. Protein kinases and phosphatases regulate many critical biological mechanisms via protein phosphorylation and dephosphorylation including cell growth, proliferation, differentiation and metabolism. Aberrations in the activity of the kinases and phosphatases involved in signal transduction have been linked to many human diseases. 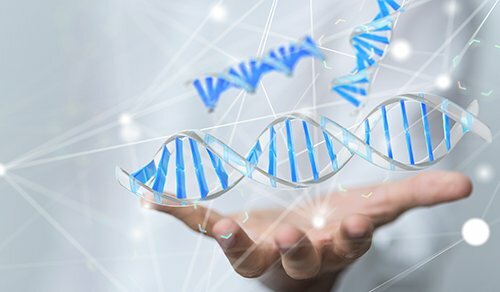 The discovery of hundreds of kinases and phosphatases encoded by the human genome has spurred development of rapid screening techniques for potential drugs against these enzymes. To address this need, Z’-LYTE® technology has been developed based on Fluorescence Resonance Energy Transfer (FRET) between a coumarin:fluoroscein FRET donor:acceptor pair. This robust, homogenous biochemical assay employs a fluorescence-based, coupled-enzyme format and is based on the differential sensitivity of phosphorylated and non-phosphorylated peptides to proteolytic cleavage. A ratiometric method, which calculates the ratio of donor emission to acceptor emission following photon excitation of the donor fluorophore at 400 nm, is used to quantitate reaction progress. The Emission Ratio remains low if the FRET-peptide is phosphorylated (i.e. no kinase inhibition) and is high if the FRET-peptide is non-phosphorylated (i.e. kinase inhibition). To account for the non-linear relationship between Emission Ratio and phosphorylation, a percent phosphorylation equation is applied to the final data. 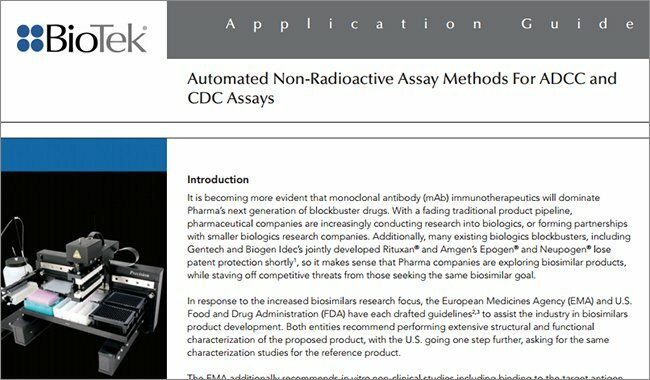 Two parallel kinase inhibition assays were performed using Tyr 1 and Tyr 6 peptide protocols to compare NEO filter and monochromator detection modes. The first was a modified kinase inhibitor Tyr 6 peptide procedure running a 16-point 3-fold serial dilution of 1μM staurosporine (inhibitor) in replicates of 4 against 2 concentrations of two JAK2 kinases: JH1/ JH2 (2600/520 ng/mL) and JH1/JH2 V617F (10,000/2500 ng/mL) at 50 μM ATP. The second was a Tyr 1 peptide profile screen for 10-point ½-log dose response selectivity of Tyrphostin AG1478 against the kinase ERBB4 (Her4) run at Km app μM ATP. 100% and 0% phosphorylation controls were run for Z’, Assay Window (Response Ratio) and percent phosphorylation calculations. 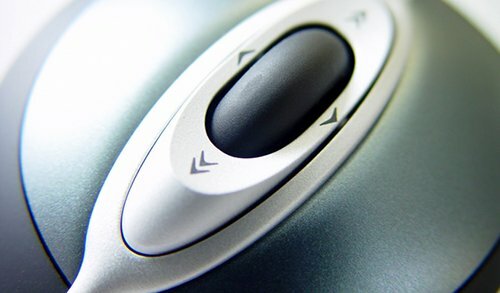 A 0% inhibition control was added to the profile assay to validate dynamic range of the screen. 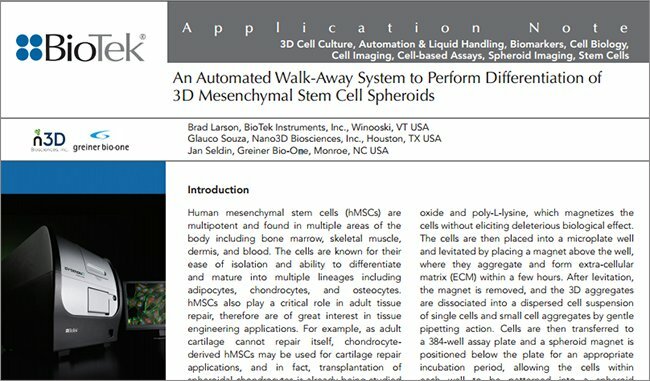 In this guide we have demonstrated Synergy™ NEO’s capabilities over a range of Life Technologies detection technologies. 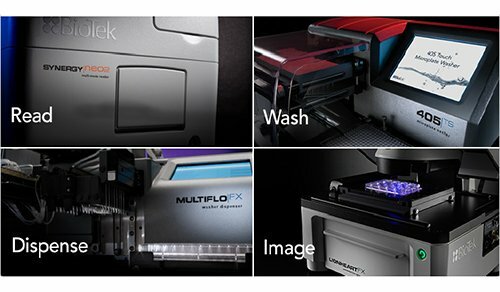 Ratiometric detection, including FRET (Z-LYTE®), TR-FRET (LanthaScreen®) and fluorescence polarization (Predictor™) all benefit from the simultaneous measurement of donor and acceptor fluorescence or parallel and perpendicular polarization measurements resulting in a microplate read speed commensurate with high throughput screening. Furthermore, the design of the optical paths have used a minimal number of optical surfaces, such as the absence of fiber optics or additional mirrors for redirecting light, which ensures high light transmission to the dual PMTs resulting in high sensitivity detection. 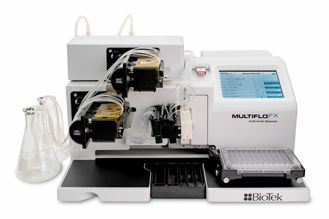 The fluorescence monochromators also provide high flexibility and sensitivity for either top or bottom reading capability in a variety of microplate formats, with those for 384-well standard and low volume microplates highlighted here. 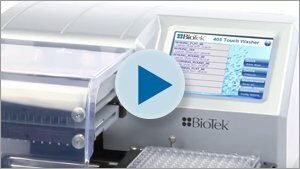 This latter capability is particularly suited to cell-based assays as described with the GeneBLAzer® application. 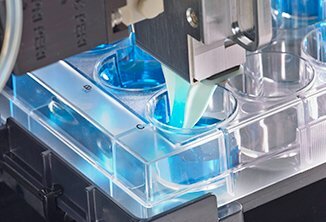 Other optical paths not demonstrated by this guide include filter-based bottom reading capability for cell-based assays with a similar high sensitivity in either fluorescence or luminescence modes. GeneBLAzer®, LanthaScreen®, OMNIA®, Predictor™ hERG and Z’-LYTE® are trademarks or registered trademarks of Life Technologies.